Austin, Texas – TEKVOX has reaffirmed its commitment to high-end customer service with a 10-year warranty for its TEK CB1-A ceiling box. A cost-effective, easy-to-use solution for boardrooms, conference rooms, mediated classrooms and training rooms, the ceiling box allows customers to include non-plenum-rated products and cables in the ceiling next to the video projector or display. Now, in addition to providing infrastructure savings, simplified maintenance and a clean attractive appearance, the TEK CB1-A offers a 10-year warranty covering electrical and mechanical integrity. It is effective immediately and is retroactive for all units shipped. The plenum- rated TEK CB1-A conforms to UL 2043 Fire and Safety tests and provides six electrical outlets for equipment inside the housing and one outlet for a projector or display external to the housing, as well as conveniently-located HDMI and control interfaces. The CB1-A has a removable steel equipment tray and optional auxiliary shelf that can mount a variety of equipment including A/V controls, HDBaseT receivers, audio amplifiers, network switches and more. An equipment tray can be installed or swapped out in minutes without any need to enter the plenum space above the ceiling. 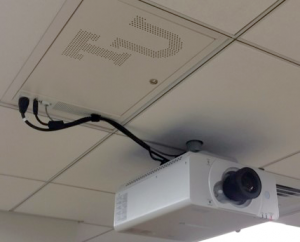 The TEKVOX ceiling box, available with custom logos and in custom colors, fits in a 2×2 or 4×2 ceiling tile next to the projector. The new 10-year warranty assures customers that the purchase of a ceiling box represents a valuable investment in reusable infrastructure. The TEK CB1-A can be upgraded again and again with just a change of the equipment tray. TEK CB1-A is an integral part of TEKVOX’s Drop-In™ solutions, which are fully-configured A/V room systems requiring no in-field programming or custom wiring. A typical Drop-In™ solution includes a TEK CB1-A ceiling box for each projector or display containing the device’s A/V controller, HDBaseT receiver and all optional equipment mounted, wired and configured at TEKVOX’s factory. “A Drop-In™is a lasting upgrade in infrastructure that is extensible for a minimum of a decade. Install once. Use many. Guaranteed,” says TEKVOX CEO Jim Reinhart. “When a customer invests in TEKVOX’s standardized, high-quality infrastructure for the class, board or conference room, they are guaranteed the ability to upgrade the electronics for generations with a simple swap of equipment trays,” he explains. For more information on the CB1-A, visit https://www.tekvox.com/product/78038-tek-cb1. TEKVOX (https://www.tekvox.com) is a private Texas company offering unique A/V control technology that brings unprecedented affordability, capability and reliability to audio/visual applications in teaching, training, meeting and interactive collaboration. Applying state-of-the-art Internet of Things (IoT) and enterprise management (EMS) technologies, TEKVOX’s distributed, networked solutions dramatically change the cost of acquiring and operating A/V-rich facilities.